Coral bleaching is closely connected with the symbiotic association of dinoflagellate algae. In corals, today the most efficient association is photosymbiosis with the endosymbiont Symbiodinium. Photosymbiosis on the reef explains the amazing success of reefs today and in the geologic past, while the breakdown of this association leads to coral bleaching and the demise of reef ecosystems. Although the symbionts are not preserved in fossil organisms, a variety of direct and indirect criteria are employed to assess their former presence. This assessment indicates that photosymbiosis was a prevalent theme throughout much of the geologic history of reef ecosystems, especially during the time of reefs dominated by scleractinian corals. Such corals appeared and diversified during the Triassic period and toward the end of this period became important reef builders only to experience extinction at the Triassic–Jurassic boundary. Suessiacean dinoflagellates morphologically are close to living Symbiodinium. Parallel trends in diversity and extinction among fossil suessiacean dinoflagellates and scleractinian corals from Late Triassic to Early Jurassic time suggest a symbiotic association. Breakdown of symbiosis was associated with mass extinctions and occurred several times during Mesozoic to Cenozoic time. Closely associated with mass extinctions were massive CO2 injection, ocean acidification, oxygen depletion of the oceans, and other perturbations of the marine environment. Most certainly, the reef environment during these critical times witnessed profound bleaching and loss of photosymbiosis and virtually collapsed. 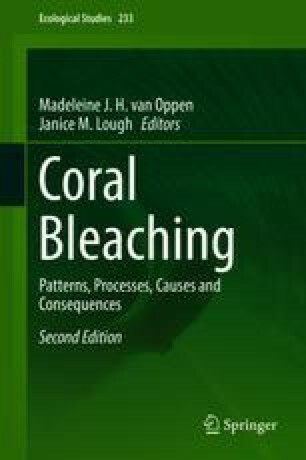 As history is our teacher, we can learn more about the current bleaching crisis among reefs by study of the geologic history of reef ecosystems.